Every new dog or puppy owner worries about training a new furry companion. Do we crate train or use a potty pad? How do we teach her to walk on a leash? Does the training start right away, or can we wait for her to get settled in her new home? By starting positive reinforcement with clicker training as soon as you get your dog home, you begin to establish a loving and respectful relationship with your dog. You can set clear expectations, reward good behavior, avoid punishment, and prevent the behavior you don’t want. Clicker training can work at any age, from un-weaned puppies to senior dogs. It only takes time, patience, and love on the part of you as a pet parent to make your dog a successful member of your family. Why should I use a clicker to train my dog? Using a clicker allows you, as the trainer, to clarify your needs to your dog. Whenever she hears that “click” noise, your pet knows she is doing what is asked and a reward is forthcoming. Clickers and other signals are considered “bridges” in dog training. Basically, the “click” sound “bridges” the time between the correct behavior and the delivered reward. Responsive dogs pick up those signals very quickly; using a clicker system can speed up your entire training program. Many trainers employ clickers as bridges because they’re inexpensive, easy to use, and have a distinct sound that can be clearly heard by your dog. They’re also perfect for the novice trainer or pet parent who needs distinct and precise signals to communicate to their pet exactly what behavior earned the reward. Additionally, training with a clicker allows other people – your family members, other trainers – to work with your dog without crossing signals and confusing her. By helping her to concentrate on listening for the clicker, your dog is able to focus more on the requested task, rather than new people, other animals, or the reward. What clicker training is—and what it isn’t. Clicker training is a gentle, yet powerful, way to train your dog that promotes the human-animal connection with a strong bond of love and respect. This type of training uses positive reinforcement as its main teaching tool. By using a handheld clicker to tell your dog, “Yes! Good girl,” at the very moment she performs correctly – and then immediately giving her a food treat – you’re building a positive association with the click. 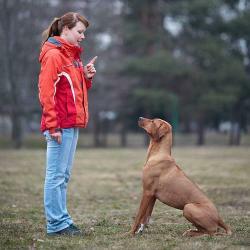 This very precise and clear instruction allows your dog to think about her behavior without needing punishment or scolding to correct mistakes. Clicker training does not use methods that would intimidate or frighten your dog. There are no choke or shock collars, nobody is going to roll her on her back to dominate her, you won’t need to yank on a leash. While these methods may cause a dog to obey through fear or bullying, they can also turn a loving pet into a frightened, aggressive danger for family members, other animals, and visitors to your home. By using positive reinforcement methods, you’re rewarding your pooch with food, fun, and toys, and a training partnership that even your children can enjoy with supervision. What can clicker training teach my dog? Not only can clicker training teach your dog to be obedient – showing reliable behavior on your cue – it gives your pet a sense of self-control, knowing that she gets love and rewards by not misbehaving. Self-control breeds confidence in a canine, as it does in both animals and humans, and this self-assurance allows your pooch not to be afraid of different kinds of touch, or strangers, or other animals. These life skills tell your dog that she can look to you for direction in scary situations, deflecting her instinctive reactions to flee or aggress. Will I have to use a clicker forever? New pet parents/trainers often worry that they’ll have to carry a clicker with them for the rest of the dog’s life. That is not the case. As a teaching tool, the clicker allows you to help your dog learn quickly and easily. Once your pooch understands the correct behavior, you can slowly wean her from its use.